Pour Me A Cup of that New Devil's Brew! July 6th, 2018 Joey J. For today’s review, I’ll be performing two cardinal sins of the uppity-up cigar snobs... that’s right, not only is this cigar a bundled option (gasp!) but it’s also flavored (oh no!). If you pop into your local cigar lounge and listen to the “experts” you’ll come away thinking that everyone only lights up Padrons, OpusX, and ultra-rare small-batch creations… but guess what? They’re lying. You see, I see the sales numbers, and numbers never lie. That’s why I know tons of people across this great nation enjoy bundled brands and flavored offerings day in and day out. To put it another way, if people were telling the truth and didn’t like Kuba Kuba, I wouldn’t have to purchase pallets of them at a clip. Today, though, we’re not reviewing an ACID, we’re looking at a line that’s much more affordable — Devil’s Weed Dark Brew Coffee Maduro. A mouthful of a name, that’s for sure, but this cigar lands comfortably at right around $3 a stick and is an absolute bargain at that price. Here’s the skinny. The repackaging feels fresh and modern, but you throw all that stuff out in the end, so at the end of the day I’m only really worried about the tobacco. That’s where things get good. Dark Brew Coffee Maduro features a smooth and oily San Andres wrapper – a particularly impressive feat when you consider how veiny and rough most Mexican wrapper leaf is by comparison. Underneath, a Dominican binder and carefully bunched Dominican long-fillers keep things interesting, with the Dark Brew delivering a profile that I feel comfortable calling medium to full-bodied. A real change of pace from many flavored options, which are typically heavy on sugar and light on everything else. Toasting the foot of this one, I was a little nervous – the cigar is softer and squishier (that’s a technical term) than I tend to prefer. But good news, this thing burns like a champ, giving off big clouds with every puff. I like an ACID every once in a while (sue me) so I was expecting tons of sugar on this sweetened cap, but it’s a much more subtle experience. Sure, the sweetness is there, but mostly I’m met with hints of dark roasted coffee smoothed out by lots of natural chocolate notes in the background. Some spice and black pepper pop up just often enough to vary the experience, but this certainly isn’t a “spicy “cigar. In short, if you love coffee, like flavored blends, or are just looking for a great value, I don’t think you can do much better for the money. 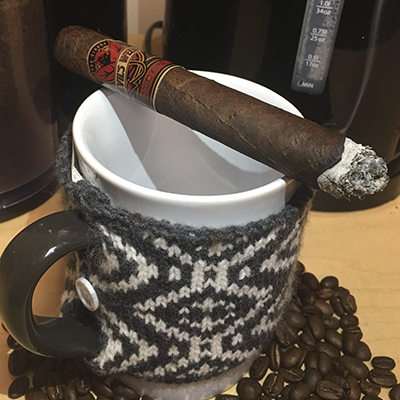 Devil’s Weed Dark Brew is easily one of my favorite bundled cigars I’ve tried, and might be the best “bang-for-your-buck” when it comes to coffee-infused blends. My only negatives: the longer sizes are a little one-dimensional, and this cigar burns a bit quick… but those are both just me being nit-picky. Grab yourself a bundle today, and I’m sure you’ll add this one to your favorites.